One way you can see some possible outcomes of your retirement plan is to use a retirement simulator similar to one available from Vanguard. These simulators use Monte Carlo methods to run several thousand possible patterns of investment returns to see how your portfolio holds up through retirement. Behind the impressive scientific-looking tools are some problems. Here I show the problems in pictures. To understand these problems, we need to look at the fairly simple way these simulators work. To generate a possible outcome for your portfolio, many of these simulators begin with some actual historical investment returns from a range of years. They build your simulated results one year at a time by choosing one of the historical years randomly and applying that year’s returns to your portfolio. 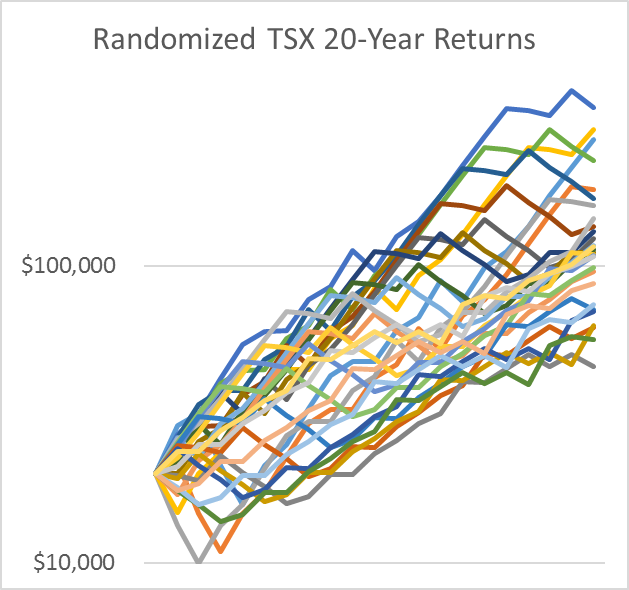 The main thing to notice is how much more spread out the 20-year returns were in the random order case. Both charts have exactly the same log-scale. 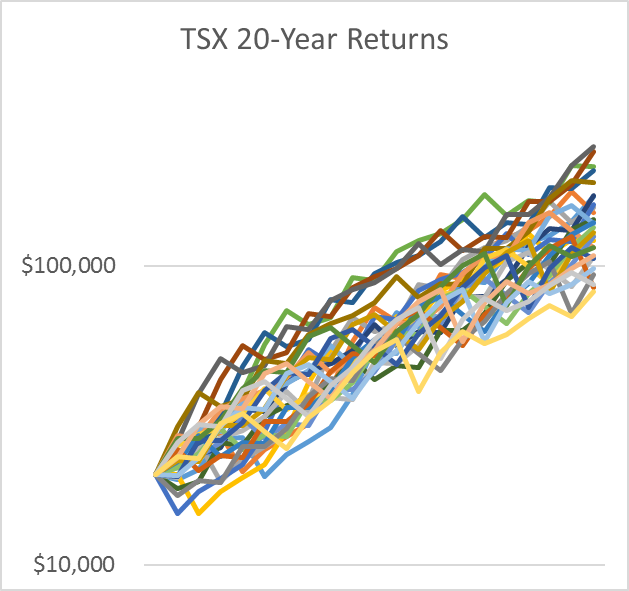 The portfolios for the TSX returns in actual order had an ending portfolio value range of $82k to $251k. For the randomized return order, the range was $46k to $339k. This is a substantial difference. 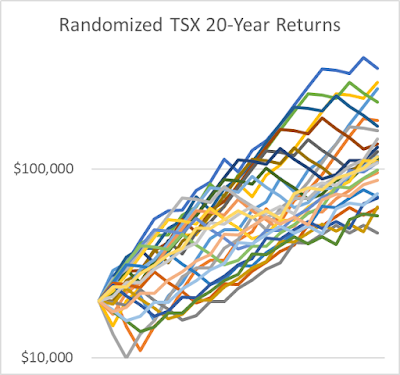 Once the return order is randomized, the portfolio outcomes become much wilder. What’s the explanation for the change? It turns out that the stock market has a tendency to revert to the mean faster than random chance would suggest. A string of years with poor returns are somewhat more likely to be followed by good returns than more poor returns, and vice-versa. When we randomize the order of the annual returns, we eliminate this effect. So, many retirement simulators give results that are wilder than you can really expect in real life. If you choose a spending level and run the simulations, the simulator might overstate the likelihood of running out of money. On the other hand, if average annual stock returns are lower in the future than they were in the past, the simulator may be understating the likelihood of running out of money. We might hope that these effects would cancel, but it’s likely that one will dominate the other, and it’s hard to say which. This doesn’t mean that using Monte Carlo simulations to get a sense of the range of possible outcomes is a bad idea. It’s just important not to be too impressed with the science and math. These simulations have two important limitations: they remove return correlations across time, and they assume that future average returns will match past average returns. Buyer beware. Canadian Mortgage Trends reports that “Mortgage Professionals Canada has asked the Department of Finance for a moratorium on mortgage rule changes until the effects of the current changes are known.” They have 5 specific recommendations. My recommendations are different. I call on the Department of Finance to do what is necessary to protect taxpayers from the possibility of having to backstop losses if we have a significant real estate downturn. Further, I call on them to pay little heed to any organization whose primary concern is transaction volume and has minimal skin-in-the-game. John Bogle comments on the likely rollback of the fiduciary rule in the U.S.
Tom Bradley at Steadyhand offers some interesting questions to ask your financial advisor about fees and services. Financial Advisor Tim Paziuk says CRM2 did not go far enough in mandating clear disclosure of all mutual fund fees. Canadian Couch Potato interviews Andrew Hallam in his latest podcast. Hallam thinks investors’ biggest mistake is paying attention to market forecasts in the media. Andrew Hallam reminds us that what we want is low-cost funds. While most index funds have low costs, not all do. Boomer and Echo explain why an RRSP loan isn’t always a good idea. Big Cajun Man reports that the Canadian economy keeps creating more part-time jobs. Million Dollar Journey reviews retirement calculators. Each one seems to have fairly serious limitations. My wife and I are in our 60's, retired, and financially pretty secure. I'm a self-directed investor. My spouse takes virtually no part in our financial life. Beside feeling that her math skills are weak, money problems were the cause of a lot of family stress when she was young. So, I do everything from paying bills to investing. I don't resent this. She has tried to get more involved, but loses interest. This is probably less about financial illiteracy, and more about anxiety and avoidance. I would like to hear your thoughts. As it happens, I’m currently helping an elderly family member sort out her finances after her husband passed. It’s been difficult. She wasn’t even sure which banks held her accounts. Her husband had taken care of everything money-related. Fortunately, he had decent paper records. In my case, my wife used to handle paying all monthly bills, and I handled investing. To a first approximation, I handled anything that involved 5-digit amounts or more. She’s never liked making decisions about big dollar amounts. Over time, I’ve simplified my investment approach, and she has learned what I’m doing a bit at a time. At the same time, paying monthly bills keeps getting easier, and I’ve learned the various passwords necessary to pay the bills. Ideally, D.L.’s wife should learn enough to take over if D.L. dies. However, it won’t do any good to show her this article and say “See. SEE!” She knows she should learn more about handling family finances, but it’s easy to procrastinate. And losing her husband is probably too difficult to even contemplate. As a bare minimum, D.L. could write a letter to his wife or whoever helps his wife pick up the pieces after he’s gone. The letter would include account names and numbers and anything else that D.L. thinks might be helpful, such as his investment approach. Then he has to make sure he keeps it up-to-date and that his wife knows where it is. Even better would be to slowly bring his wife into both the financial decision-making and the execution of decisions with online accounts. This would include paying bills and making trades. But, I do mean slowly. It’s tempting to go on and on explaining every little thing. It’s better to have a new 5-minute lesson every week or so. Maybe start with just logging into a chequing account and paying one bill. Keep it short and let her control the keyboard and mouse. Over time, she will hopefully build confidence in both her ability to decide what needs to be done and how to do each step. But it has to be done slowly and calmly. I think D.L. should approach this process as collaborating with short lessons instead of anything remotely confrontational. I like to vacation with friends, but working out how to split the costs can get tricky. When it’s just two couples, we often use the you-paid-last-time-so-I’ll-pay-this-time method. But we both have a tendency to try to pay a little too often. Nobody wants to look like a cheapskate. When more people are involved, it gets trickier. I recall going out to lunch with co-workers when I was in my 20s. Pre-split bills were less common back then, and we’d each figure out what we owed and toss money into the pot. It almost always came up short. I never knew whether people were bad at adding taxes and tips or if someone was deliberately cheating. In later years, though, we had a different problem; we’d end up with too much money in the pot. This is better than coming up short, but it’s still a problem to be solved. With more than two couples traveling together, there is a tendency for more than one person to try to pay for each expense. To try to pay my fair share, I’ve even resorted to wandering off late in a restaurant meal, finding the server, and paying the bill before it ever gets to our table. One possible solution to all this is for everyone to pay their own way at every stage. But that would mean splitting up grocery bills for multiple card payments, and everyone lining up to pay for their own round of golf. It’s so much easier for one person to pay and to sort it out later. I’m trying out a process of entering all items in a spreadsheet. So far this system has worked well. We don’t worry about getting things correct down to the penny; it’s just about making sure we end up close enough. At any given moment, we can see who has paid too much and who too little. That makes it easy to decide who should pay the next bill. This has led to another interesting effect. Nobody wants to be the person who hasn’t paid enough. We all want to get out ahead. Of course, that isn’t possible. If one person has paid too much, someone else has paid too little; it all has to add up to zero. I’ve been mulling ways to put people at ease. One possibility is to have the last line of the spreadsheet just say who should pay next instead of showing positive and negative dollar amounts. Another possibility is to add $500 to each total and say that it only goes negative if you fall behind too much. In any case, I’d rather deal with this minor problem instead of having everyone contribute the same number of quarters every time we go over a toll bridge. There are worse things in the world than having friends who care about paying their fair share. Is it Really Necessary to Check Your Credit Score? Steadyhand uses an infographic to show the costs that eat into investment returns, including an often-missed factor: investor behaviour. Robb Engen gives a strong defense of the Latte factor. It’s not about denying yourself the occasional indulgence. It’s about cutting down on habitual mindless spending. Investment News reports that an advisor “allegedly cost clients $1.3 million by placing trades through a master brokerage account and then allocating profitable trades to himself while placing unprofitable ones into client accounts.” Most retail stock pickers prefer to think about just their profitable trades, but this is a way to truly make bad trades not count. Canadian Couch Potato interviews the great Charles Ellis in his latest podcast. “We’re now very close to 99% of all trading is done by expert professionals.” Canadian Couch Potato also has some advice for an investor just starting to invest in a non-registered account in addition to existing RRSPs and TFSAs. Big Cajun Man discusses Bill C-462 that seeks to prevent opportunists from gouging people for help accessing disability tax credits. Dan Ariely has some very interesting insights into the nature of financial advice and how it’s delivered. Jason Zweig warns us about very high hidden fees in managed futures funds. Kerry Taylor gives a primer on Tax-Free Savings Accounts on CBC News Network. Canadians have several misconceptions about TFSAs, and Kerry clears them up. My Own Advisor measures his investment approach against some advice from Tom Bradley. Frugal Trader at Million Dollar Journey lays out his personal financial goals for 2017.